Certified Estate Planner, Estate & Retirement Advisor, Owner & Founder of Senior Financial Security, Inc. Seniors are a big target for common money scams and identity theft for several reasons. First, seniors typically, or are thought to, have large amounts of money in their various accounts, own their own home, and/or have good credit. In addition, financial scams often go unreported, so they are considered a “low-risk” crime. This is especially true with seniors because 1) they might not know who to report to, 2) are too ashamed they have been scammed, or 3) are completely unaware they have been scammed. However, when financial scams are reported, seniors tend to make poor witnesses. With the effects of age on memory, con artists are counting on seniors not being able to name key details or descriptions. Finally, fraudsters believe they can fluster seniors in several scenarios, so they believe there is a better chance seniors will act on their emotions and do something sudden. This “must act now” attitude has gotten many seniors in trouble. 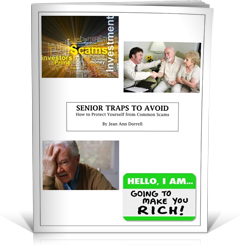 Please fill in the fields below to download your copy of ‘Senior Traps to Avoid: How to Protect Yourself from Common Scams’. ©2018 Jean Ann Dorrell. All rights reserved. Material discussed is meant for general illustration and/or informational purposes only and it is not to be construed as tax, legal, or investment advice. Although the information has been gathered from sources believed to be reliable, please note that individual situations can vary, therefore, the information should be relied upon when coordinated with individual professional advice. Primary Life Insurance and Annuity products offered in association with Allianz Life, American Equity, ING, Old Mutual, and SunLife Financial. Please call toll free 1-866-829-3337 to arrange a convenient, no fee discussion of your estate planning objectives. Senior Financial Security, Inc. does not give legal, tax or accounting advice. We recommend you consult your own attorney, tax advisor or accountant concerning the interpretation and revision of tax laws and regulations.